Twenty-first century Mardi Gras dance music including traditional New Orleans dance tunes, spirituals, and original compositions. 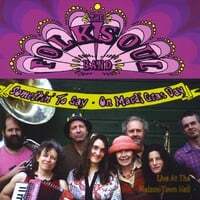 In 2007 musicians from 2 unique area bands (Tattoo and Lunatic Fringe) came together to celebrate Mardi Gras in our hometown of Peterborough, NH. It was so successful, and so much fun, that we decided to continue and The Folksoul Band was formed. Since then we've been exploring American roots music as it grew from the soil of slavery and redemption, beginning in the fabled city of New Orleans, and eventually flourishing throughout the rest of the country. Instead of looking at it as other people's history from somewhere else, we try to draw it from within ourselves. After all, this is our music, our story, our country.